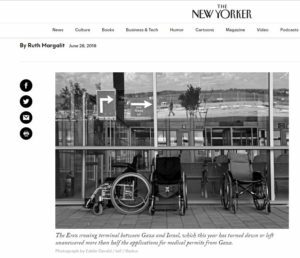 Since CAMERA compelled The New Yorker to correct the false claim earlier this month that there are no MRI machines in the Gaza Strip, the media watch organization uncovered additional falsehoods which require correction in the June 28 article (“Many Gazan Women Are No Longer Able to Enter Israel for Cancer Treatment,” Ruth Margalit). First, the article falsely alleges: “since the beginning of 2018, with no announcement of a change in policy, more than half of applications for medical permits from Gaza have been turned down or left unanswered, according to Physicians for Human Rights – Israel, or P.H.R.I., a nonprofit organization that represents many of these patients.” PHRI provided The New Yorker with false information, and The New Yorker unfortunately passed on PHRI’s inaccurate information to readers without any qualification or clarification. This false information is likewise repeated as fact in the prominent photo caption at the top of the article (as well as in a widely retweeted New Yorker tweet). When confronted with the monthly figures, Efrat Mor of PHRI, Margalit’s source for the story, agreed on Twitter that she was wrong and, in fact, more than half of the medical permit applications were approved. Next, an Israeli military spokesman who spoke with CAMERA disputed the detailed claims of the two Gazans patients whom PHRI, an organization which has already proven to be unreliable, referred to journalist Ruth Margalit. In January, she was allowed into Israel for an MRI and radiation therapy, but since then her application for a permit has been declined four times without explanation. According to the Israeli spokesman, Abu Taema did indeed enter Israel in January for medical treatment, but since then has not reapplied for an additional entry. The Palestinian Civil Affairs Committee has likewise not received any requests from Abu Taema since her January visit. Thus, Abu Taema’s claim that her application permit was declined four times was flatly rejected and refuted by the Israeli authority, with whom New Yorker never consulted. She applied for a medical permit last December (the permits are only valid for a few weeks) but has not been approved to cross the border. “I never got a refusal, but they keep saying it’s ‘under review,'” she told me. [T]he resident has a valid security clearance, and the Israeli authorities are waiting for updated hospital appointment information in order for her request to be approved. The relevant details have been transferred a number of times to the Palestinian Civil Affairs Committee, and no response has been received from them as yet. Thus, by omitting the fact that the delay in Mekhael’s case is on the Palestinian side in the context of a story based on the false charge that Israel “has turned down or left unanswered more than half the applications,” Margalit falsely attributes the delay to Israel. 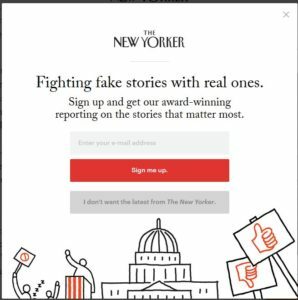 In short, far from “Fighting fake stories with real ones,” as a New Yorker advertising banner which appears at times on top of the severely flawed Gaza cancer patient article boasts, the esteemed publication is churning out fake stories of its own. CAMERA has contacted editors to request corrections on these points. Stay tuned for an update. This article was amended July 15 when it came to light that the earlier information referred to a different cancer patient also named Amani Abu Taema. She had applied for a medical permit in April (and it was recently approved).